For the first time under the Vth Republic, the incumbent President is behind his main challenger. One of the central conclusions of the campaign is the rejection of the EU as it currently works and calls for increasing protectionism: even Sarkozy demands modifications to the Shengen accord and Hollande a renegotiation of the Lisbon Treaty. A quick analysis of the results show that, in one way or the other, the vast majority campaigned on a platform that will lead to a frontal shock with Germany: budget balance and austerity vs. social welfare and deficits, southern Europe vs. Northern Europe, domestic demand oriented growth vs. export oriented growth. 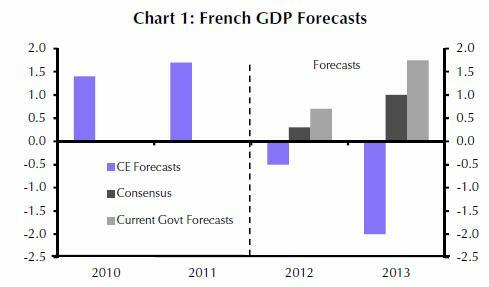 In addition, both Sarkozy and Hollande built their programs on an over-optimistic GDP growth forecast to cut borrowing at 0.7% in 2012, 1.75% in 2013 and 2% until 2016, well above consensus (most politicians do overstate future growth to buy votes). and neither is addressing the key issues holding back growth. For example, last week the IMF revised down 2013 French growth to 1.0%. Then, the Parliamentary elections will come in June and there is no chance whatsoever that the current ruling party wins, even if Sarkozy is re-elected. The antagonism with the Front National is too entrenched and the possibility for the Front National candidates to have enough votes to remain in 1/3 of constituencies for the second round. If Sarkozy is not elected (the likely outcome as of today since over 1/3 of Bayrou and 40% of Le Pen voters will abstain for the second round, the rest will go +/- 50/50 for each remaining candidate), I also expect the current ruling party to fall in shambles with infighting between Coppée (current Head of the ruling party - UMP) and Fillion (current Prime Minister – a senior member of UMP) each preparing for the next Presidential race in 2017 (Fillion will present himself at the mayoral election for Paris). I then forecast the Front National to try its utmost to organize the opposition to the the socialists around its platform, with some with the right wing of the UMP joining forces with the National Front, and possibly Dupont-Aignan. 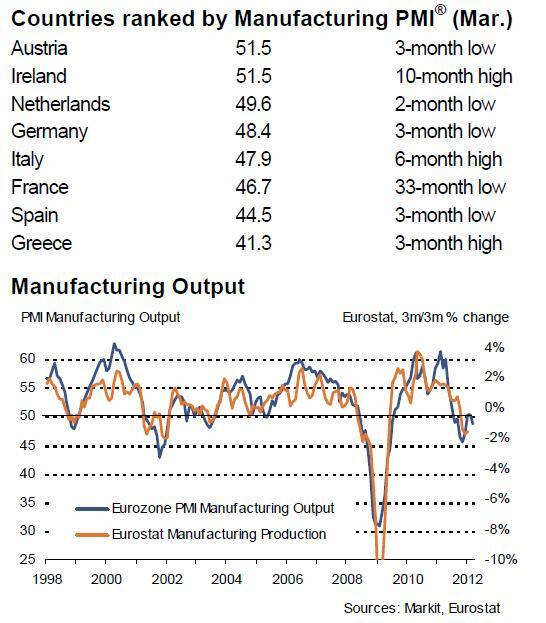 I usually do not post this kind of economic data, since there are so many published every week. I am doing so since the numbers are striking, France in particular is a real disaster. As I indicated many time, forget about Portugal, Spain (well not really, do not forget Spain!) and Italy, France is the sick man. 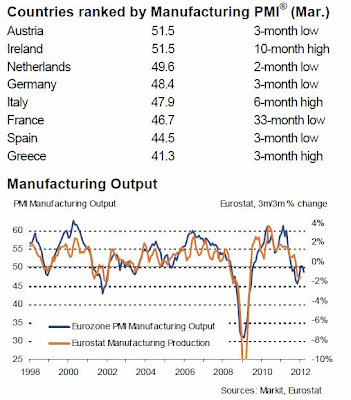 France: 33 month low (yes, you read it right!) @ 46.7 (I heard on the French radio that the 2 French auto-manufacturers – Renault and Peugeot – had sales 30% down in March; the French auto industry, Peugeot in particular, is entering the danger zone for its survival). The roots of the problem have not been addressed, and politicians are still in denial territory: the construction of Europe for the past 20 years is a failure due to a dogmatic approach.